The State of Maine is a magical place. Once you’ve lived here for a little while it becomes part of you, and the longer the exposure the more ingrained the sights, sounds, smells, and tastes of Maine become. And that is why gift that reminds you of Maine is such a valued present. Maine has many iconic tastes, from wild blueberries, to maple syrup, and from whoopie pies to Moxie. Each of them can revive treasured memories from Mainers away from home. Even the distinctive shape of the State of Maine can bring back a flash of The Way Life Should Be. Unfortunately, in the same way that parts of Maine are hard to get to, good Maine gift ideas are also tough to come by. They are out there, if you know where to look. So to help you find the perfect Maine gift, we came up with this list of the best Maine gift ideas. 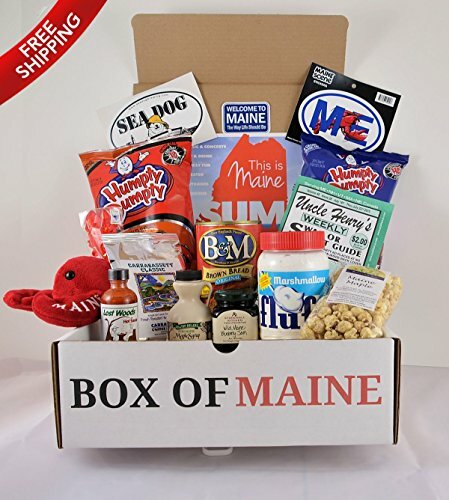 The number one Maine Gift idea on our list is Box of Maine, and for good reason. Whether you’re a diehard Mainer who has had to move away from your home state for work or family, or you have a loved one who can’t get enough of Humpty Dumpy chips (who blames them really? 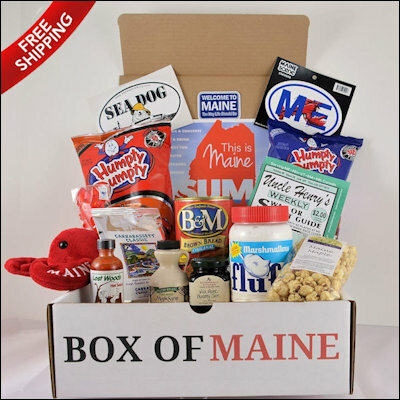 ), this box of Maine goodies is sure to put a smile on any Maine-lover’s face. This gift box includes a Chocolate Whoopie Pie, container of Fluff, can of Moxie, Maine Maple Syrup, Wild Blueberry Honey, Humpty Dumpty BBQ Chips, Needham’s Chocolates, Acadia Roast Coffee, Wild Maine Blueberry Jam, and a Maine Woods Candle, all in one convenient package that ships nearly anywhere. That’s a hard deal to beat! This company doesn’t just sell a standard gift set, either, they allow for box customization so you can tailor the Maine goodies you send to your loved one. And as a bonus they also ship to military addresses and internationally, so everyone can get a taste of Maine, no matter how far away they are. A tip for the wise: you’ll want to stock up on their whoopie pies, they freeze wonderfully and are a great way to feel like you’re back home when your sweet tooth strikes. Food has a unique way of transporting us back to a location. Whether it’s your grandmother’s kitchen on Sunday morning, or enjoying a fresh batch of pancakes when you’re up to camp, food creates a real sense of place for everyone. 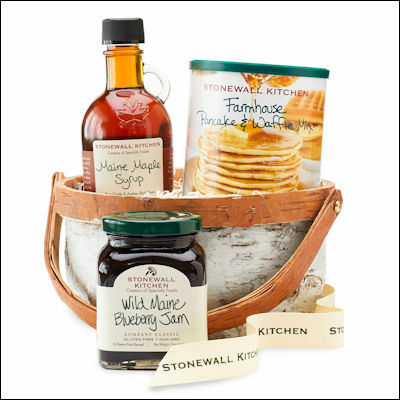 Which is why the Stonewall Kitchen Breakfast Basket is an amazing gift for anyone missing Maine. Stonewall Kitchen is a Maine-based company that specializes in spreads, jams, preserves, and other unique foods that bring real home cooking and quality ingredients together in a way you won’t find anywhere else. 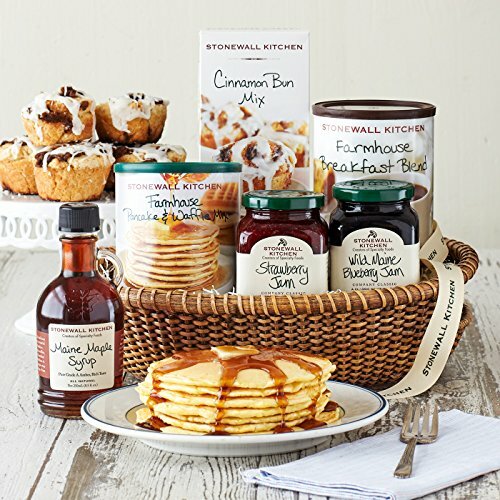 Not only does this gift basket have the backwoods feel of a family camp, it comes stocked with everything you need for a true Maine breakfast, complete with wild Maine blueberry jam (other brands can’t compete), real Maine maple syrup, and of course farmhouse pancake and waffle mix to really take your breakfast over the moon. Even if the weather is 75 degrees and sunny where you are, this gift basket will bring back memories of a warm flannel, a roaring fireplace, and an early morning snow as you tuck into the best breakfast from the best state out there (yes, we know we’re biased). And if you find yourself falling in love with Stonewall Kitchen’s other products (we have to give a nod to the mango pepper jelly, it’s unbelievable on toast) they have a wide distribution so you can get your loved ones (and yourself) Maine-based delicious goodness no matter how far away from good ol’ Maine your travels take you. Includes some of our best combinations of jams, mixes, syrups, and more all in attractive boxes or baskets. A cutting and serving board is more than just a tool. It’s the centerpiece of the table, somewhere where creativity and cooking come together to light up a room. A serving board will bring up old memories of meals past, of childhood adventures and favorite snacks, and a great serving board will remind you of where you came from and who you have to thank for where you are now. The Maine Cutting Board is more than just an amazing housewarming gift for anyone moving out of state for the first time, it’s the perfect way to memorialize a visit to Maine that will come up at dinner parties or a late night snack for years to come. 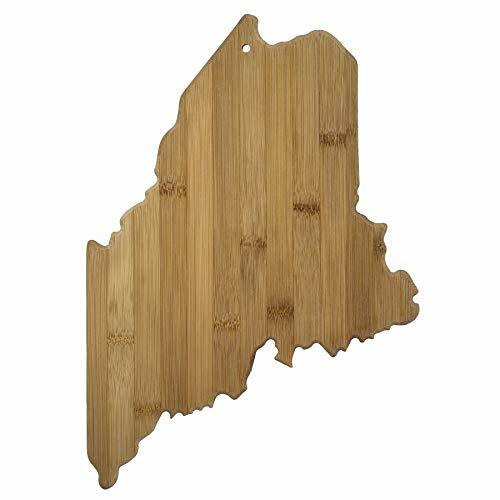 This is a practical gift that will find its way either to the center of a kitchen or the center of a wall, where just a glance will remind everyone of your last Maine adventure. Plus, this cutting board is on the larger size, leaving plenty of room for large cooking adventures or full-scale serving platters (just make sure to purchase some Stonewall Kitchen jams to go with your spread of choice). Perfect for food prep, serving or display; board measures 15" x 10-1/2" x 5/8"
Remind them where their heart truly belongs with this stunning decorative piece, perfect for hanging on the wall or standing by a set of picture frames to show that even if they only visited Vacation Land, they always have a place nearby. Alright, so the heart is on Portland and not everyone has been to Portland (you are missing out if you don’t at least give it a visit once), but the background paneling lists out the major cities and towns in Maine in a heartfelt gesture that will leave friends and family trying to find their town of choice in the background. The simple distressed wood design makes it perfect for almost any aesthetic, and the small but striking size makes it perfect for sending almost anywhere. 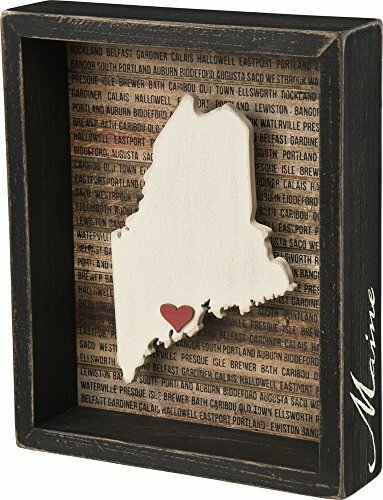 Plus, if you have friends and family who are moving to Maine, nothing says the perfect housewarming gift like this adorable picture frame that will remind them that they are now officially on their way to becoming Mainers. Just be sure to remind them that the accent, of course, comes later. Smell has a weird way of instantly transporting you, even more so than food does at times. Thanks to the clear air and natural surroundings of Maine, anyone who has spent time in another state and come back to Maine will tell you that the air is clearer here, and easier to breathe. Unfortunately, sending someone a jar of air can be rather frustrating, so the Maine Scented Candle is a good alternative. This candle starts with a note of blueberries, not the overpowering smell that you are hit with when someone takes a blueberry pie out of the oven, mre the sweet, warm air of berry picking in the summers. 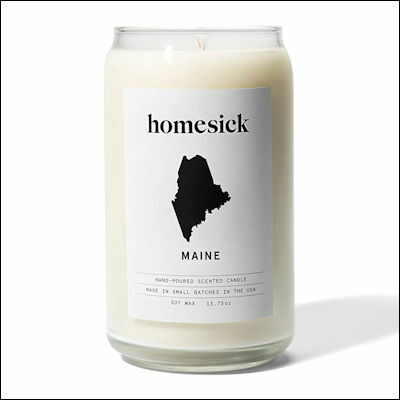 It then transitions into lavender and honeysuckle, the two most prevalent flowers along the wood in Maine that tangle themselves up in the pine notes both in the forests and in this candle. The cedar and patchouli scent ground this candle, giving you the feeling of standing on the back porch of a farmhouse in fall just as the leaves start to fall. These small batch, hand-poured soy candles are the perfect gift for anyone who feels homesick in the long term. 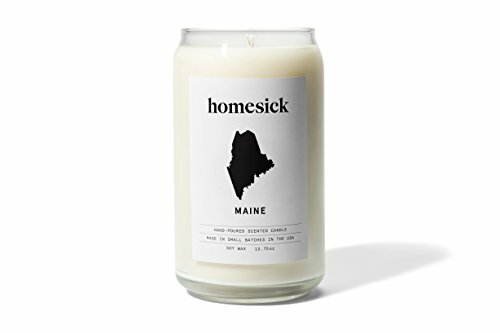 And with a 60-80 hour burn time, this candle is a long-lasting present that will help stave off the homesickness until their plane can touch down in the Portland airport and they can once again breathe the clean air of Maine. Okay, the air in the Portland airport isn’t that clean, but the sentiment stands. Scents of fresh Maine blueberries, pine wood, and autumn hayrides. Woody notes of cedarwood and patchouli balanced by a floral bouquet of lavender and honeysuckle. 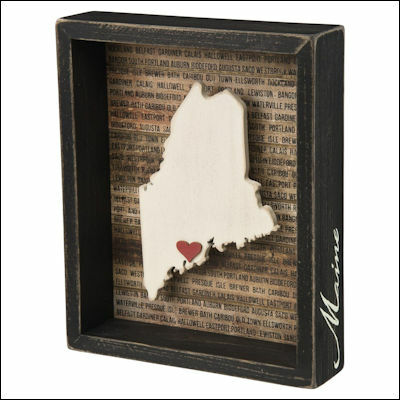 No matter the gift of choice, a piece of Maine stays with anyone who visits this state, and what better way to help them feel their connection to this wide and wonderful place than with a gift straight from the heart?